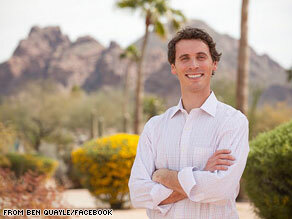 Quayle, the son of former Vice President Dan Quayle, is one of 10 Republicans vying for the GOP nomination for the third House district. Rep. John Shadegg announced in January that he was retiring and would not seek re-election. Shadegg's former chief of staff, Sean Noble, announced on his political blog Monday his endorsement of Steve Moak, one of Quayle's nine opponents for the congressional seat. "Steve Moak is not a fraud like another candidate in the race that is trying to trade on the family name to get elected to a position that he would squander," Noble wrote, seemingly referencing Quayle. "CD [Congressional district] 3 deserves to be represented by the adult in the race." Quayle's campaign issued a statement Monday night in response to Noble's endorsement. "Mr. Moak has already hidden behind his non-profit; now he hides behind his campaign consultant," said Quayle campaign spokeswoman Meghan Rose. "He needs to stop hiding, stop hurling hollow insults and start answering some tough questions about his use of a non-profit to make himself a wealthy man and his concealment of the scheme from the IRS." The primary will be held on August 24. 1. He has loaded up every child in this nation with more debt than any President in history. 2. With his policies and the threat of more such policy, he has destroyed more wealth than any human being in history, which is always what happens when you set out to redistribute wealth: you end up destroying it. 3. He has brought us to the brink of the most massive tax increases in history and if we don't elect enough Republicans in November to stop him that is exactly what we will get. 4. He has forced through legislation without a single republican vote that may well destroy the finest health care system in history when all we needed were some measures to control costs. 5. He has divided America along racial lines in destructive ways and he is doing so again by suing Arizona over its attempt to control the drug trade and human smuggling trade threatening its security. 6. He has failed to form a policy to adequately deal with the vicious Mexican drug cartels that are essentially running parts of that nation and becoming an increasing threat to ours. 7. He has traveled the world making apologies for America instead of defending its timeless and treasured ideals of freedom and peace for all nations of good will. 8. He has said there is nothing exceptional about America, something no other president has ever said and something which alone suggests he is a historically poor president. 9. He has hired people of strange and radical views to hold important federal posts in which they pursue more bad policy that no administration in history has ever pursued. Quayle doesn't like Obama? Sounds like an endorsement to me. 1) debt was due to 8 years of mismangagement and war. How could Obama cause the mess? It was already here? How stupid could someone be? 2) Best healthcare? We spent twice the developed world average per capita and were ranked near Cuba! How ignorant can one be? 3) He caused the race problem? Why because he is black? lol. Who out there believes there was no race problem before Obama? How blind can one be? So, Quayle, nice try but the party of no is not getting my vote. We are in a transition period that requires many good plans any yes decisions. A good international image is going to be needed when the threat of resource wars comes around. Unfortunately, the memory of Americans is short and they lack the understanding of long-term planning. Thus, the party of no is likely to win many votes. How stupid can we be? "The list did not include any evidence to back up Quayle's claims." Unfortunately, in our post-Palin, post-Beck world, facts and reason are no longer relevant. I doubt Ben can cite any real evidence for any of his claims. For example, Obama never said that The Unite States is not exceptional. He said that he, like everyone, else believes their country is exceptional. Well, duh. Sounds like Obama was just stating the obvious. Ben probably didn't understand what Obama was saying, too many big words and nuances for him. Ben Quayle is even more ignorant and dense than his father, which is quite an accomplishment in and of itself. Please. Go home now and play with your toys and leave governing to people who clearly know what they are doing. Did you not know that your daddy is not smarter than a fifth grader? Did you not know that your daddy was the worse vp ever? Did you not know that your daddy could not spell "potato"? Did you not know that your daddy was the dumbest VP ever? Can anyone tell me why this is a news story worthy of the coverage it has gotten to date? After all, it's not like this guy is in the same league as Joe the Plumber. This is beyond belief. The ravings of a sheltered imbecile, who has endorsed the policies of transferring more wealth over thelast 30 years into the hands of the top 2%, and he complains about the POTUS's efforts to reverse 3 decades of bad policies which his father helped to create? What jobs has the Quayle family created in the last 30 years? The only cost that needs to be contained is giving this brat free Federal Health care as a member of Congress. Did Ben's dad write that list of reasons? Or did Brock Landers? Like moron father, like moron son. So the guy makes stuff up, and it's reported as news? Does he pay you? Where to even start with this..All Obama's done has saved America from the brink of collapse. Even so, it still wont' be enough cause Republicans are dead set on it, it seems. As far as redistribution of wealth...haven't you been doing that to the poor and middle class for 30 years now? I mean, after all, we pay for wars to support government contractors while our schools crumble, our health care system becomes an abysmal failure (my drs tell me to go to Canada for treatment btw). Just let me ask the logical question, what do Republicans honestly think is going to happen when your gun laws arm everybody to the teeth, yet you cut police forces and teachers, and cut funding letting them starve...you talk about cartels, I don't know if you've visited any major city recently or not but they are all ready war zones. This is why Republicans are a threat to the security of the United States. Shut up you IDIOT!!! If you think attacking Obama is going to get you elected, you are a bigger idiot! What it is doing is bring more attention to how stupid you are! I wonder if this jerk can spell potato. These conservatives all are cut from the lineage. Some of the statements made by him would almost make you think that he was kin of Sharon Angle. Wow sounds more like Mark Williams. Ben Quayle's nine reasons on why President Obama is the worst President in history are typical of right-wing dogma. Coming from a state that vows to enforce a highly discriminatory immigration law, his rhetoric doesn't surprise me at all. Ben, have you forgotten your father for the worst ever Vice President? Never should have been elected anything? Obama, at least has a brain and an IQ of acceptable range. The fruit didn't fall far from the tree, at least as dumb as his Dad. He might want to look up how much debt the bush-quayle years piled up and oh yeah that willie horton ad was a real appeal to racial unity. I'd say there must be something in the water in Arizona, but it's a desert. This guy may be the poster child for the evils of inherited wealth, take away his family money and name and you'd have a half-wit asking you if you want fries with order. 10. Alll of the above 9 reasons were actually caused and apply to the Republicans and the Bush Administration. Crawl back under the rock you been under for the past 10 years. He did a good job of describing the Bush regime. Some in the media attack Mr. Quayle for calling Pres.Obama "the worst President in history". Those same members change their opinion, do a 360 degree, and attack Gov. Palin after a Alaskan "teacher" essentially does the same as Mr. Quayle. They show us just how bias they are. If they had any consistency of thought they would have attacked the protester. A republican, calling a democrat president the worst. Why does that not surprise me and why is it news? Ok..was this "list" written by a 3rd grader?!?! Sarah can't even top this guys stupidity! Actually, who am I kidding!!!! With each new copy, the copy gets fuzzier and dimmer.